I read once somewhere that every blog has to have kitten pictures. Since I'm not much of a cat person, I figured my chance of ever posting a cat picture was pretty slim, so I have tried to make up for it with cute kids and a dog that I'm trying to kill. So imagine how thrilled I was to open my inbox yesterday and find that Kim (my sister-in-law, brother Steve's wife) had sent me a batch of pictures; and lo-and-behold, what did I find: a kitten picture! and a good excuse to post it! Ok ... it wasn't exactly like that. First off, I didn't just "open my inbox" and find them there. I opened Outlook Express and waited fifteen or twenty-minutes for the first batch of four pictures to download (and this over DSL!). They were some big, high-quality pics, probably taken at 7 or 8 megapixels. There was also some confusion about repeats... but by the next day, and after about a dozen emails, I had received all of the pictures. Great quality, but big enough to choke gmail's pop3 server. In the end, I had to log into the gmail web interface to download them. I already knew that Kim is an aspiring professional photographer, but what I didn't realize was that my 9-year old nephew Lane is also a budding talent. Turns out the set of pictures she sent me were prize winning submissions to a photography contest at the Johnson County Fair-- some of them taken by Lane, and some taken by Kim herself. 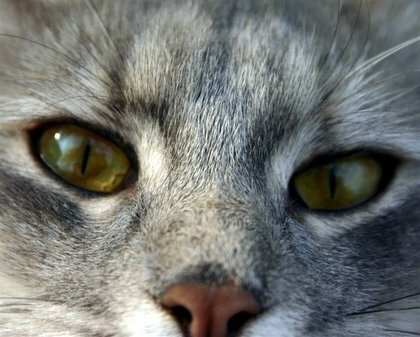 The kitten picture shown above was taken by Lane, and won a blue ribbon for the Color digital - Animals category. The above b&w picture of a leaf won a blue ribbon in the "nature study" category, and took overall Grand Champion in the Digital B&W category. He also won Reserve Grand Champion in the same category for another picture; according to Kim, the judge said he "couldn't believe a 9 year old took those pictures", but she then points out that he was 8 when he took them! I've posted Lane's four award-winning pictures to the gallery: here. I've also posted a batch of Kim's ribbon winners as well; all in all, some really neat pictures! I've got a couple more blog posts coming up; if life stabilizes a little, I'm going to try and post more frequently over the next few days, and see how that works out. I've posted this week's daily pictures of the house under construction here; you can see the day-by-day progress by watching it as a slideshow, or clicking here. Again, I sincerely apologize for the huge file of pictures I sent, and I also apologize for the confusion! By the way, the BB's picture that I took also got a Blue Ribbon. Oh, and for the record, I'm not really a "cat person" so much as you would think, she's just a very snuggly kitty and I have a soft heart for loving animals. Thanks for posting our pictures!